Scientists with the Marine Mammal Center said Wednesday that the gray whale that washed up on the Rodeo shoreline in unincorporated Contra Costa County last week died of severe malnutrition, but due to decomposition they've been unable to pinpoint its underlying cause. "This animal is representative of a growing issue for migrating gray whales who appear unable to sustain themselves due to shifting food source availability," the center's chief research pathologist Padraig Duignan said in a news release. The 40-foot whale was an adult male, and center staff said he should have been a skilled forager, but the animal's death may be related to changes in the ocean's food web. They found very little blubber or body fat on the carcass, as well as very little content in its stomach and intestinal tract. 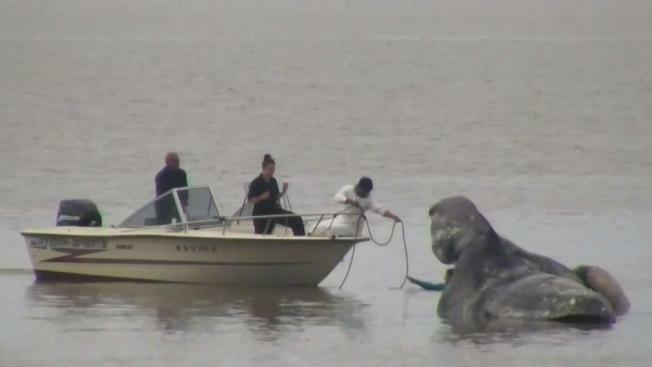 A dead whale has washed ashore in Rodeo. 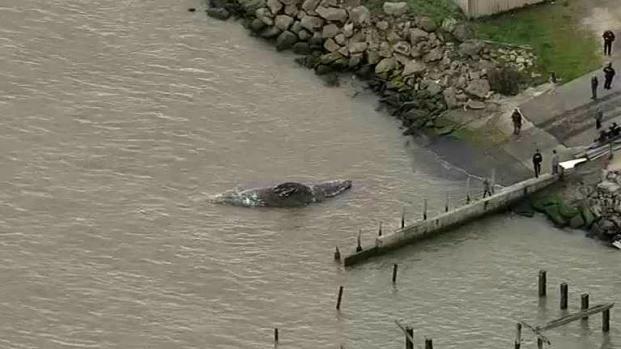 "The death of a third gray whale in San Francisco Bay this year is a cause for serious concern as it speaks to the broader challenges this species continues to face in its ocean home," Duignan said.